If you have been diagnosed with asbestos related pleural thickening in the last 3 years then you will be able to make a claim for compensation. The success of the claim will depend on whether the company where the asbestos exposure occurred is still in existence. If you are not sure, don't worry; it could be that the company was taken over, or that the insurers of the company still exist. In either case we will find out on your behalf as part of the service. Can I Make a Claim for Pleural Thickening? For advice on whether you can claim for pleural thickening, simply call us on freephone 0800 923 0046 or complete the form at the bottom of the page. 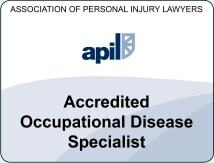 Our solicitors are specialists in making asbestos disease related claims and work solely in this area of the law. They have an excellent success rate and are dedicated to maximising the value of your pleural thickening claim. The pleura is a two-layered membrane which surrounds the lungs and lines the inside of the rib cage. 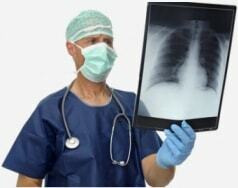 Pleural thickening can be caused by long term exposure to asbestos. Occasionally the asbestos fibres irritate the pleura and may cause fibrosis or scarring to develop there. It can become widespread and can cause the pleura to thicken. This thickening is called diffuse pleural thickening. Pleural thickening usually affects both lungs and this is known as bilateral pleural thickening, although they are not always affected to the same extent. There are various morphological types of pleural thickening. Diffuse pleural thickening can occur from malignant and non malignant causes (including asbestos) whereas nearly all of the common causes of nodular pleural thickening are malignant. Other causes of pleural thickening include tuberculosis, radiation treatment, chemotherapy, various drugs, lupus, malignant tumours. Pleural plaques develop in a similar way to pleural thickening but are localised to one area and don't usually interfere with breathing . Please visit our pleural plaques page for more information on this particular asbestos related condition. What are the Symptoms for Pleural Thickening? When the pleura is thickened and scarred it becomes less elastic and constricted, which can cause shortness of breath. Other symptoms include chest pain and tightness, especially after physical exertion. It can be quite debilitating for some sufferers and affect their quality of life. Pleural thickening can also cause psychological stress; sufferers may live in fear that they could develop a more serious asbestos-related disease. Asbestos has been extensively used for many different purposes both across industry and domestically. As we are now fully aware, this posed a substantial risk to those exposed to the material. The dangers of asbestos exposure have been known about for decades, however, it has taken too long for action to be taken and the industry has been slow to react. As a result many people are now suffering with asbestos related industrial diseases such as pleural thickening. Pleural thickening can take 20 years or more to develop, so ill effects are not instantly traceable to asbestos. How many people suffer from Asbestos Related Pleural Thickening? The Health and Safety Executive (HSE) only started to record the incidence of asbestos related pleural thickening in 1991 when there were only 150 cases reported. This has risen dramatically over the decades since reaching a peak in 2010 with 505 cases reported. The average number of reported cases per year over the last decade is 340. Not surprisingly there are many more male than female sufferers representing the male dominated professions of ship building, plumbers, carpenters, plasterers, miners, gas fitters etc. who may have had prolonged exposure to asbestos during their working lives. Unfortunately there is no treatment for pleural thickening - the effects of asbestos on the lung are irreversible. Diagnosis will require chest X-rays and CT scans to differentiate between this and other asbestos related diseases. Once diagnosed with this particular type of disease, the person will need to have regular follow ups with their doctor to check that it doesn't progress to a more serious asbestos related condition. There are a couple of things which may help the sufferer maintain a decent quality of life. The first is to stop smoking straight away if they currently smoke. The second is to undertake regular exercise, remembering to start off gently if they are unused to exercise. Both of these actions should help to keep the remainder of lung healthy and functioning. Call us on free phone 0800 923 0046 for advice on making a compensation claim for pleural thickening.